Apartaments Delfin in Playa De Palma is an apartment building. Situated right on the beachfront in Can Pastilla, Apartamentos Delfín offers modern air-conditioned apartments with a balcony or terrace and great sea views. Palma Airport is just 4 km away. Each stylish Delfin apartment is decorated in white, with touches of bright colour. Each one has a living-dining room with a flat-screen TV and a kitchen with a ceramic hob, dishwasher and washing machine. Bathrooms feature a hydromassage shower, free toiletries and a hairdryer. Towels and bed linen are prov...ided and a cleaning service is also included. Apartamentos Delfin is located just a 10-minute stroll from Can Pastilla Marina. The seafront promenade is lined with bars and restaurants. The historic centre of Palma de Mallorca is 8 km away. Situated right on the beachfront in Can Pastilla, Apartamentos Delfín offers modern air-conditioned apartments with a balcony or terrace and great sea... views. 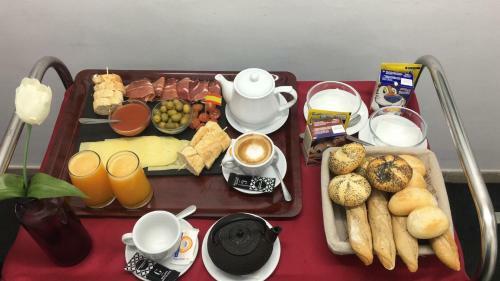 Palma Airport is just 4 km away. Each stylish Delfin apartment is decorated in white, with touches of bright colour. Each one has a living-dining room with a flat-screen TV and a kitchen with a ceramic hob, dishwasher and washing machine. Bathrooms feature a hydromassage shower, free toiletries and a hairdryer. Towels and bed linen are provided and a cleaning service is also included. Apartamentos Delfin is located just a 10-minute stroll from Can Pastilla Marina. The seafront promenade is lined with bars and restaurants. The historic centre of Palma de Mallorca is 8 km away. 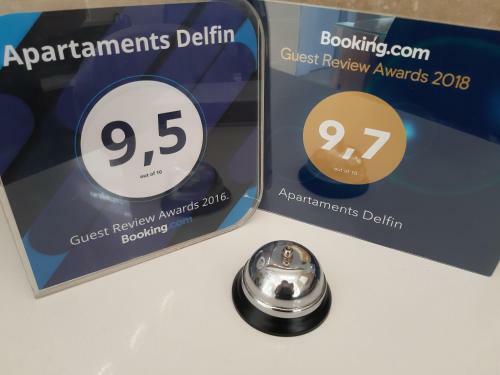 When would you like to stay at Apartaments Delfin? Children and extra beds All children under 4 years stay free of charge for children's cots/cribs. All children under 13 years stay free of charge for extra beds. All older children or adults are charged 20 % of the room stay per night per person for extra beds. All children under 13 years stay free of charge when using existing beds. All children from 13 to 16 years are charged 20 % of the room stay per night per person when using existing beds. The maximum number of children's cots/cribs in a room is 2. The maximum number of extra beds in a room is 2. Supplements are not calculated automatically in the total costs and will have to be paid for separately when checking out. Any type of extra bed or child's cot/crib is upon request and needs to be confirmed by the innkeeper. GroupsWhen booking for more than 6 persons, different policies and additional supplements may apply. Please inform Apartaments Delfin in advance of your expected arrival time. You can use the Special Requests box when booking, or contact the property directly with the contact details provided in your confirmation. Guests are required to show a photo identification and credit card upon check-in. Please note that all Special Requests are subject to availability and additional charges may apply. In the event of an early departure, the property will charge you the full amount for your stay. This property will not accommodate hen, stag or similar parties. A damage deposit of EUR 250 is required on arrival. This will be collected by credit card. You should be reimbursed on check-out. Your deposit will be refunded in full via credit card, subject to an inspection of the property. When making a reservation for more than 6 persons per booking, different policies and additional supplements may apply. Please let the property know your expected arrival time in advance, since reception closes at 14:00. Check-in between 14:00 and 19:00 will have no extra charge as long as the property is notified in advance. From Monday to Saturday, the reception is open from 09:00 until 14:00. On Sunday, the reception opens from 10:00 until 14:00. Please note that late check-in carries the following charges: From 19:00 to 22:00 EUR 20; from 22:00 to 00:00 EUR 30. from 00:00 to 02:00 EUR 50 Please note it is not possible to check in after 02:00.